Despite two elections [presidential and parliamentary] this year in which the far-right parties demonized by the Yanukovych regime and the Kremlin have shown abysmal results, there has been no real let-up in the propaganda from Russia. In an interview for German ARD, Russian President Vladimir Putinclaimed that he feared ethnic cleansing and a descent into neo-Nazism in Ukraine. 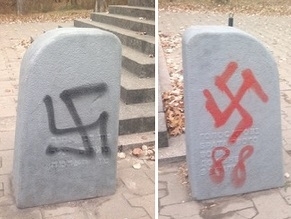 The Resolution on Anti-Semitism in Ukraine was signed by the Society of Jewish Culture of Ukraine; the Jewish Council of Ukraine; the Jewish Forum of Ukraine; the Association of Jewish Organizations and Communities [Vaad] Ukraine, the Zionist Federation of Ukraine and the Ukrainian Union of Jewish Students. – The democratic government in Ukraine, formed as a result of the victory of the Revolution of Dignity, the early presidential and parliamentary elections, despite the most difficult circumstances of armed aggression, is in constant and construction dialogue and cooperation with the Jewish community, including with respect to investigating incidents of an anti-Semitic nature”.